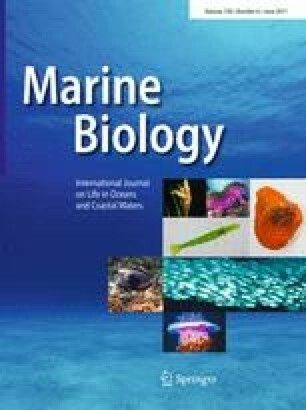 Sequence variation in the mitochondrial control region was studied in the Mediterranean rainbow wrasse (Coris julis), a species with pronounced pelagic larval phase inhabiting the Mediterranean Sea and the adjacent coastal eastern Atlantic Ocean. A total of 309 specimens from 19 sampling sites were analysed with the aim of elucidating patterns of molecular variation between the Atlantic and the Mediterranean as well as within the Mediterranean Sea. Phylogeographic analyses revealed a pronounced structuring into a Mediterranean and an Atlantic group. Samples from a site at the Moroccan Mediterranean coast in the Alboran Sea showed intermediate frequencies of “Mediterranean” and “Atlantic” haplotypes. We recognised a departure from molecular neutrality and a star-like genealogy for samples from the Mediterranean Sea, which we propose to have happened due to a recent demographic expansion. The results are discussed in the light of previous studies on molecular variation in fish species between the Atlantic and the Mediterranean and within the Mediterranean. Communicated by M. I. Taylor. The authors would like to acknowledge the kind contribution of Enrico Arneri, Ferdinando Boero, G. Andrea de Lucia, Paolo Domenici, Maria Ghelia, Menachem Goren, Paolo Guidetti, Miquel Palmer, Sergio Ragonese, Alfonso Toscano and Nedo Vrgoc who helped in obtaining specimens for analysis.